One of the stars of our spring shoot is the Theo chair by Simon Pengelly. You can see it below, sitting pretty with our new Lawn blanket. Theo is a lightweight, stacking chair made with a bent-ply seat and back and a wooden frame. The version below is in oak and is without arms. It is an elegant, refined, quiet piece of design. 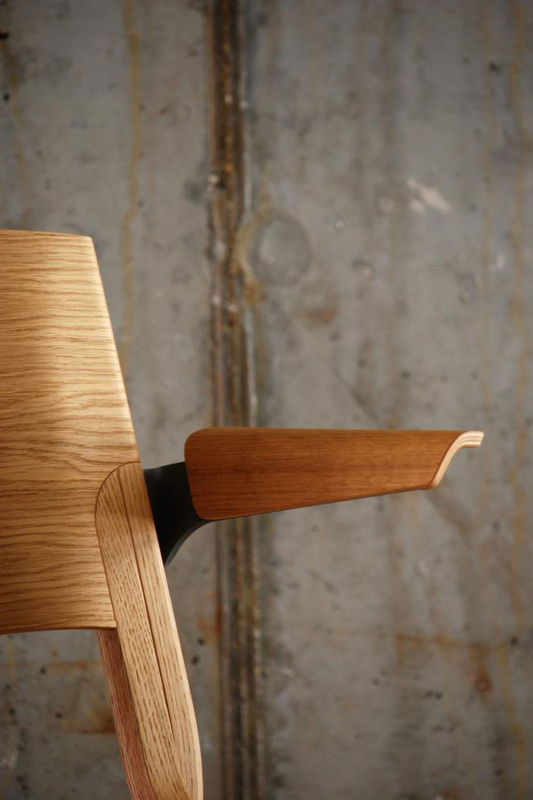 The Theo chair was designed by Simon Pengelly for Chorus for use in churches and cathedrals as a practical, contemporary alternative to traditional pews. The weight and flexibility of the chair were paramount - it is extremely light, stackable and can be linked side-to-side to form rows. Although originally designed for churches and cathedrals, the Theo chair is equally at home in a wide range of domestic and contract spaces. It is available in a range of colours and finishes, and the complete Theo range includes upholstered and arm chairs as well as a range of stools, benches and tables. And much more information, including a wonderful film about the production process here.